We were eagerly awaiting Aveda’s new Shampure Dry Shampoo and are excited about it’s release. Dry shampoos have gained popularity in recent years, and this is Aveda’s first dry shampoo product. 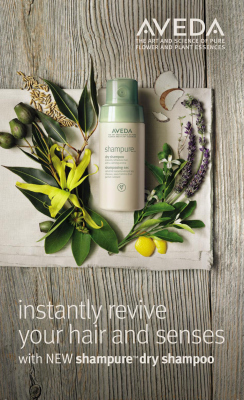 Shampure Dry Shampoo combines the convenience of dry shampoo with Aveda’s tradition of high quality and eco-friendly ingredients. Interested in learning more about Aveda’s Shampure Dry Shampoo? Read on! Shampure Dry Shampoo is a convenient and easy to use product. As with all dry shampoos, it is meant to be sprayed on dry hair. Simply spray Shampure Dry Shampoo on your hair to add shine, clean your hair and fortify it. Shampure also adds a great, fresh scent to your hair (more on that below). Shampure works on all types of hair. One of the unique aspects of Shampure Dry Shampoo is the non-aerosol bottle. Shampure comes in a unique, bioplastic bottle that is more environmentally-friendly than conventional aerosol bottles. To use it, you turn the bottle upside down, right side up again, then spray to release the shampoo as a mist. You can tilt the bottle to release more of the shampoo if needed. Although the bottle may take some getting used to, we commend Aveda on using a non-aerosol, eco-friendly bottle. Shampure’s calming aroma comes from a combination of 25 pure flower and plant essences. The scent isn’t overwhelming, but it does help to provide a fresh scent to your hair when you’re on the go. Shampure Dry Shampoo is available at XEX. It can also be ordered directly from Aveda online here. 25 pure flower and plant essences.